A premium microfiber towel designed for spray waxes! What makes the Buff & Gloss Spray Wax towel different than any other microfiber towel? The microfiber loop, or lack there of! A conventional microfiber towel features a thick pile that contains thousands of looped fibers. The Buff & Gloss Spray Wax towel features a loop-less microfiber pile, virtually eliminating any possibility of streaking or smearing from your spray wax or spray sealant. A lot of thought went into the design of the Buff & Gloss Spray Wax Towel to ensure it was the best microfiber towel for spray waxes and spray sealants – bar none! Use with a high quality spray wax, like Wolfgang Fuzion Spray Wax. 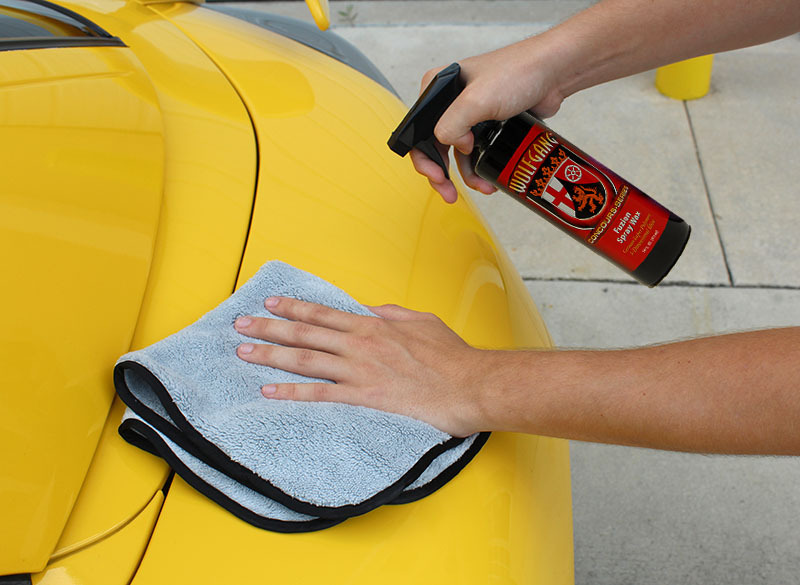 The Buff & Gloss Spray Wax Towel features a scratch-free silk border that ensures dark or soft colored paint systems don’t get scratched as you buff off your favorite spray wax or spray sealant. Details like this make it obvious that the Buff & Gloss Spray Wax Towel was designed by perfectionists for perfectionists! A spray wax, like Wolfgang Fuzion Spray Wax, is a quick and easy way to add a coat of protection to your vehicle. Advancements in surface care technology have enabled such spray waxes to provide months of paint protection, almost matching the durability of a conventional liquid wax. When applied with the proper towel, like the Buff & Gloss Spray Wax Towel, a spray wax or spray sealant can be applied to your vehicle in less than 10 minutes! Tip from the pros: Always plan on using two Buff & Gloss Spray Wax Towels for application of a spray wax or spray sealant. Use one towel to distribute the product after it has been sprayed onto the surface, and a second towel to buff off any excess residue. Using two Buff & Gloss Spray Wax Towels further reduces any possibility of streaking or smearing. The Buff & Gloss Spray Wax Towel is sized perfectly at 16 x 16 inches, making it easy to manage, even for those with small hands. Pair the Buff & Gloss Spray Wax Towel with your favorite microfiber detergent to enjoy years of use. Very good buff and spray towel that I love to used. I consider this a speciality microfiber fused only for spray on waxes. It is the perfect size for one hand to wipe while the other hand sprays the wax. It washes up softer each time I place in the washing machine. I also have found that the spray wax comes out of the microfiber fairly easily in the laundry, leaving me with a "new" looking cloth but only softer than before. I highly recommend this product. ConsI just use it with spray waxes,otherwise I have plenty of different cloths to handle or tasks, It's like a tool that only does one thing but for people who use a lot of spray waxes, this is a great microfiber to own and it washes up really well. Very good quality set of really soft towels that are great, especially on black cars. They are priced right and that makes them a good value as well.I recommend them to all. Thank you Auto Geek. So far, so good. Very soft and lint free. Used these with Rupes 808 spray sealant. Streak-free, haze-free, lint-free application.